We have greatly expanded Omnifile's academic range by including abstracts and indexing to over 18,000 dissertations in the field of art. These will be included in Omnifile to begin with and then rolled out to the Art Full Text database. Patrons can also access the full text of any of these dissertations using the OpenURL link on each one. We will be updating these dissertations on a monthly basis and will add more subjects as time goes on. We hope that your patrons find this new feature of Omnifile useful, and that it will help with their research. Our Essay & General Literature Retrospective, Short Story Index Retrospective and Book Review Digest Retrospective databases now feature links to the full text of public-domain books and other materials available through the HathiTrust digital library. HathiTrust is an inter-institutional repository of digitized books, which currently "houses" more than 4.6 million volumes, approximately 15 percent of which are public domain works. H.W. Wilson Director of Product Management Ron Miller says, "Wilson's precise and granular indexing provides valuable discovery of individual stories and essays from the public domain books available through the Hathi Trust repository. Using Wilson's analytical indexing adds a new level of search and retrieval precision not found elsewhere." You'll find some 3,700 links to full-text works on Book Review Digest Retrospective: 1905-1982; Short Story Index Retrospective: 1915-1983 features more than 1,330 links; and Essay & General Literature Retrospective: 1900-1984 features more than 3,320 links to full-text materials. We hope these additional resources prove useful for your library and its patrons. The enduring appeal of the original Star Wars trilogy is summed up very well in an article from Scientific American, February 1998, which reviews a Star Wars exhibition at the National Air and Space Museum, Washington. D.C. The article highlights George Lucas's genius in creating a universe that featured "gleaming metal and overfriendly machines", but was also "ancient and battered, filled with characters drawn more from the imagery of medieval romance than from science fiction". The strange creatures with which Lucas populated this universe were also more "familiar from a trip to the zoo", all of which "remind us that what we are seeing is really not so implausible". 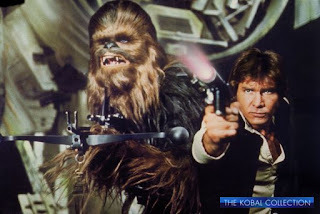 This article is available in full in Readers' Guide Full Text Select, and a range of images from the Star Wars movies can be found in Cinema Image Gallery.